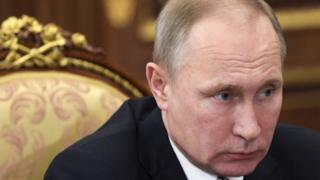 The Kremlin has demanded an apology from Fox News over "unacceptable and offensive" comments about Vladimir Putin made by presenter Bill O'Reilly. In an interview with President Donald Trump Mr O'Reilly described President Putin as "a killer". Mr Putin's spokesman Dmitry Peskov said that an apology from the "respected television company" should be sent. Mr Trump was being questioned about his counterpart's alleged links to the murders of reporters and dissidents. "He's a killer though, Putin's a killer," Mr O'Reilly commented in the interview. Mr Trump replied: "There are a lot of killers. We've got a lot of killers. What do you think? Our country's so innocent?" Mr Trump said he respected President Putin and would prefer to "get along with him". He said he wanted help from Russia in the fight against "Islamic terrorism". The new president's opinions on Mr Putin are being closely watched in the US, where the intelligence community believes the Russian president orchestrated widespread computer hacking during the recent election to help Mr Trump win. Why does Kremlin favour Trump? Many Republicans were unhappy at Mr Trump's assertion in the interview with Fox that the US was not always "innocent" in the way it behaved. Senate Majority Leader Mitch McConnell described Mr Putin "as a former KGB agent [and] a thug". But Vice-President Mike Pence insisted that Mr Trump would not "let semantics or the arguments of the past get in the way of exploring the ability to work together with Russia". Congresswoman Nancy Pelosi said she wanted to know: "What do the Russians have on President Trump?" The Democratic leader has called for an FBI investigation into Mr Trump's links to Russia. Mr Trump and Mr Putin spoke in a telephone call on 28 January - the first since Mr Trump assumed office. It was described by the White House "as a significant start to improving the relationship between the United States and Russia".